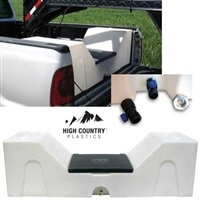 We carry Top of the Line Water Tanks for your Horse Trailer and water tanks for your Pick-Up Truck. Do you use your horse trailer? Do you bring along water for your horse to drink? No more spilling those small 5 Gallon jugs. Our water caddies are designed for most horse and stock trailers, keeping in mind how much horses love to drink from home. All water tanks carry a 3 year warranty. PLEASE NOTE: If you order these water tanks on line or by phone- they will be shipped directly from the factory. *PLEASE NOTE - Water tanks are priced to ship FedEx Ground only in the Contiguous Continental United States (48). No International Shipping. Please do not select Next Day Air or Second Day Air. If you need the tanks more quickly you may phone us for a shipping quote. We do our best to get these tanks out to you in a timely manner - Typically they go out in 1-2 business days. **The manufacturer of the water tanks do try their best to remove all loose plastic pieces from the water tanks before shipment, from holes that are drilled etc. Unfortunately, sometimes some pieces do remain. They do recommend, as with any new food or water container that you purchase, that it is rinsed thoroughly before its first use. The plastic is FDA Approved, and is considered safe, but smaller pieces could possibly be consumed or clog the valve.